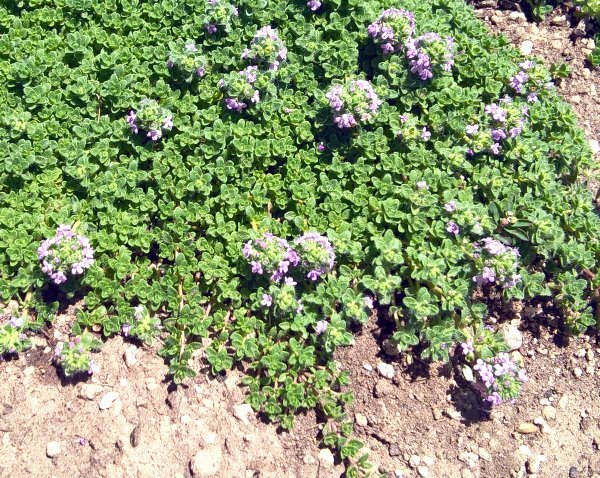 Leprechaun Thyme is a Mountain Valley Growers' introduction. 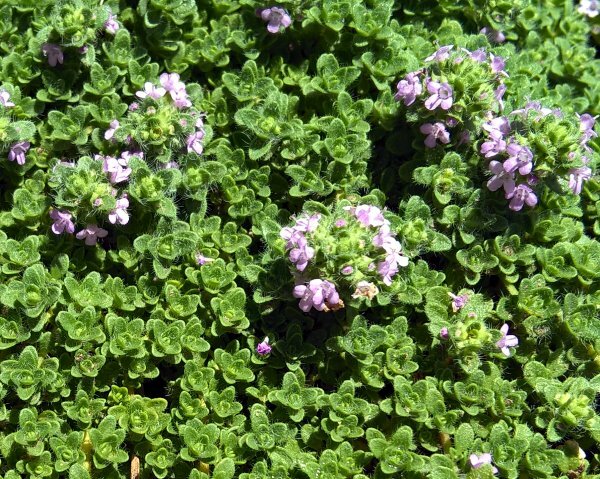 Discovered here growing among Pink Lemonade Thyme, also a Mountain Valley Growers' introduction, and Elfin Thyme, it combines attributes of both of these to give us a distinctive tiny leaved thyme perfect for growing between flagstones. We have been growing and trialing Leprechaun Thyme for four years. 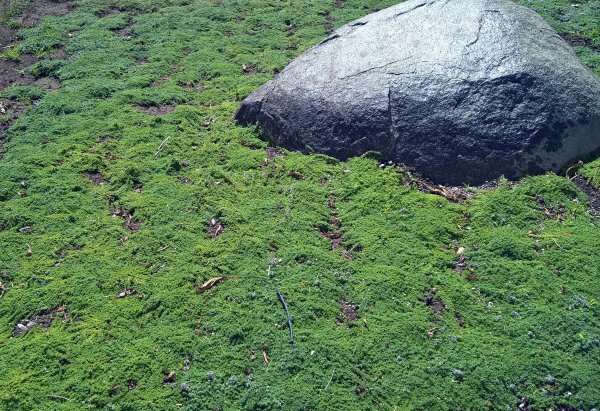 We wanted to make sure it was different enough from our other creeping thymes before we added it to our list of ground cover thymes. We are pleased to announce that Leprechaun Thyme very much deserves a place on our list and in your garden. These little patches of Leprechaun Thyme were planted from plugs three years ago on six inch centers. The bright green leaves are closely spaced and held close to the ground. Because the leaves are so tiny and the stem segments so short Leprechaun Thyme spreads slowly, which makes it an ideal choice for in between stepping stones. A more rapidly growing ground cover thyme like Pink Lemonade Thyme, would have been a better choice for this location. Leprechaun Thyme has a light lemony scent which is unusual among ground cover thymes which for the most part have no scent. As you can see, it is not just the leaves that are petite, the flowers of Leprechaun Thyme are also really small and are held very close to the ground. The little pink flowers do not usually cover the plant but pop up here and there which makes for less of a dead-head show when flowering is done. In fact we never notice when they are through flowering because the flowers are so tiny. This plant is often available in plug trays. These trays hold 128 of all the same plant. They are a great low cost way to fill a lot of space. Each cell is 3/4 of inch by an inch. Check here to see if Leprechaun Thyme Plug Trays are available.